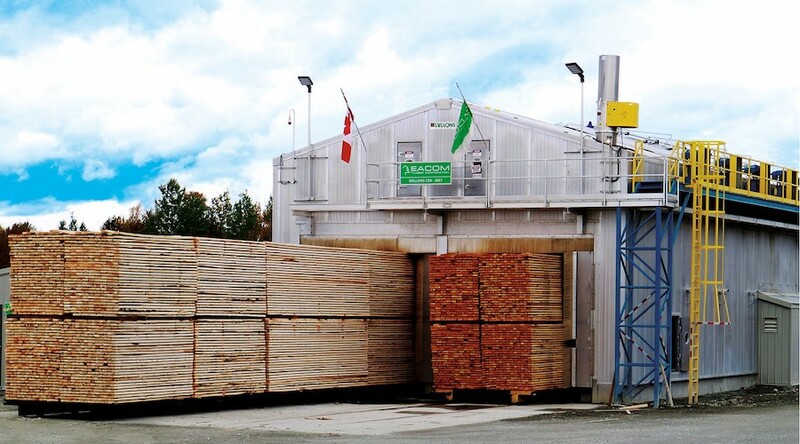 Dec. 10, 2018 - CFI has a rundown of the newest kiln technology for drying Canadian lumber in 2018. KBI and Secovac offer an integrated product suite for your dry kiln, optimizing your drying operations while increasing your bottom line. The Kiln BoosterTM enables efficient drying at lower temperatures while decreasing drying times by up to 25 per cent, optimal for mills with wetter SPF sorts or balsam fir. The AccuStopTM in-kiln moisture reader measures the lumber moisture content (MC) during the entire drying process within one per cent endpoint accuracy for highly repeatable and consistent results. The system can be integrated with virtually any computerized kiln controller but when used in conjunction with Secovac’s Dry Kiln Control System, it utilizes the MC readings to automatically advance the drying schedule segments and shut off the kiln, resulting in shorter drying schedules, tighter MC distributions and higher grade outturn. 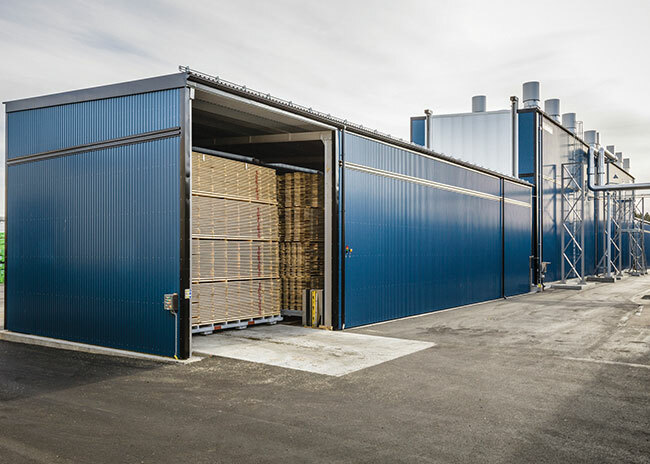 For over 36 years Mühlböck Drying Technology has manufactured lumber drying kilns and its own state-of-the-art control software. Mühlböck’s focus is on high quality lumber with a narrow moisture spread, also suited for mass timber production. 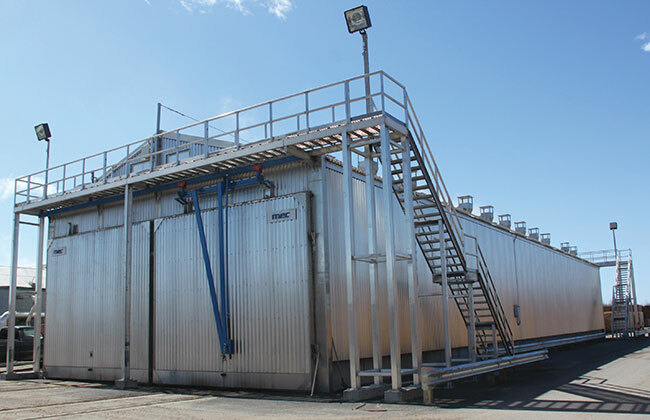 Aside from Mühlböck’s heat recovery system, which reduces thermal energy costs by about half, the innovative CDK system also comes with custom-made buffer zones for loading and unloading, reducing operating costs by eliminating night-time loading. 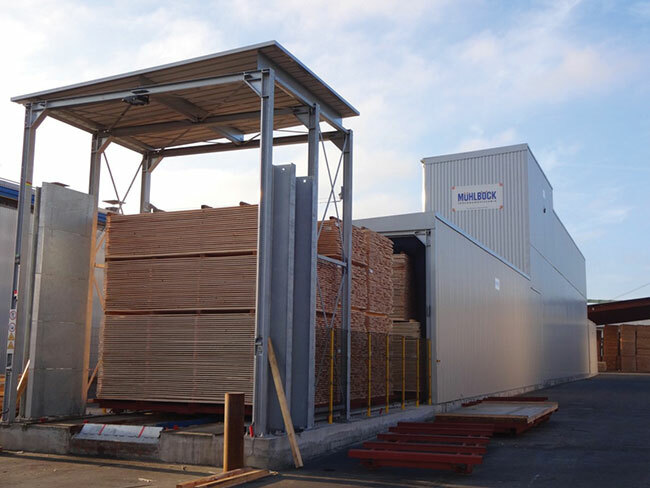 Delco Forest Products out of New Brunswick, Canada, plans to install the first Mühlböck Progressive 1003 Continuous drying kiln in North America. Sechoir MEC Inc. designs and builds dry kilns responding to the needs and requirements of the industries. 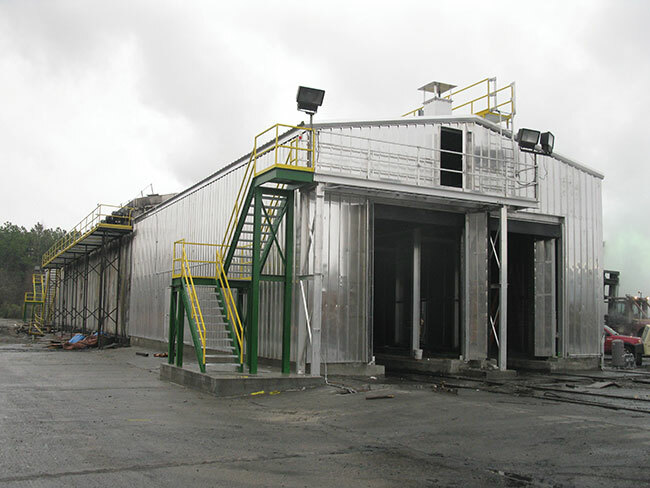 Mec’s all-aluminum kiln has six-inch thick walls, valued R24; eight-inch thick roof, valued R32, and has custom dimensions to meet customers’ criteria. Mec innovates constantly to offer a product that is always state-of-the-art in the technology. Flexibility, reliability and easy to operate are only some qualifiers to describe its products. 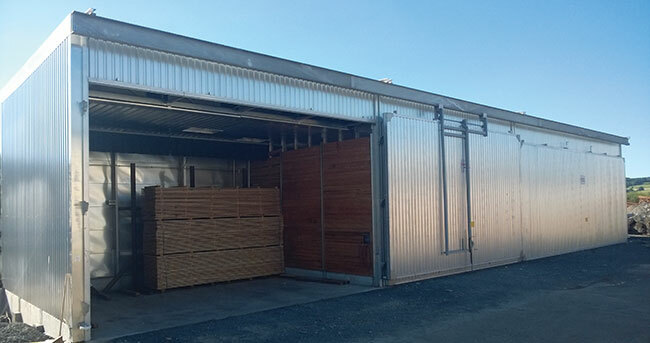 American Wood Dryers LLC has been producing quality efficient dry kilns to the lumber industry for over 30 years, with installations throughout the world. 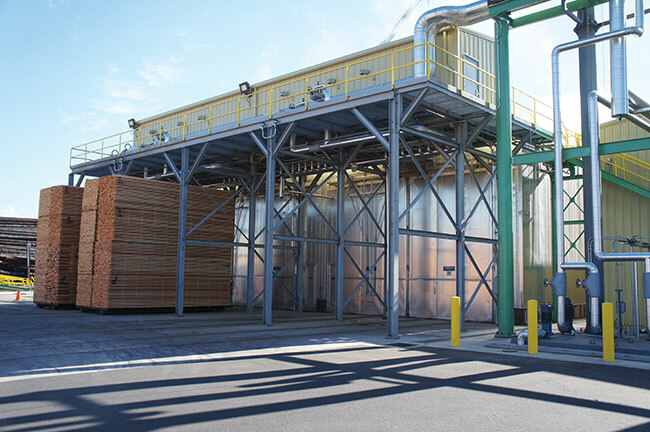 Everything from package kilns for smaller volumes of hardwoods to large volume high throughput conifer kilns, such as high temperature and/or continuous track kilns, are available. Heat systems include hot water, steam, hot oil, and natural gas or biomass direct fired. Circulating air systems can be direct drive kiln duty motors or standard motors mounted external of the kiln chamber. VF drives are supplied for power economy. Drystar PC based proprietary control systems or PLC systems supplied to customer preference. Having supplied over 500 kilns, Wellons Canada’s extensive kiln expertise includes double track, single track and side loading configurations; double and single air pass fan systems; direct fired, thermal oil, steam or hot water heating systems and multi-zone configurations; steel, aluminum, stainless or hybrid kiln material option. Wellons batch kilns utilize WINKILN control systems with Wellons TCS real time in-kiln moisture measurement, and Wellons/Windsor continuous dry kilns (CDK) utilize the Windsor Dryspec control system with DryTrack Echo moisture measurement. Notably some of Wellons’ recent batch kiln conversions to CDK have shown 100 per cent production increases and over 30 per cent energy reduction. 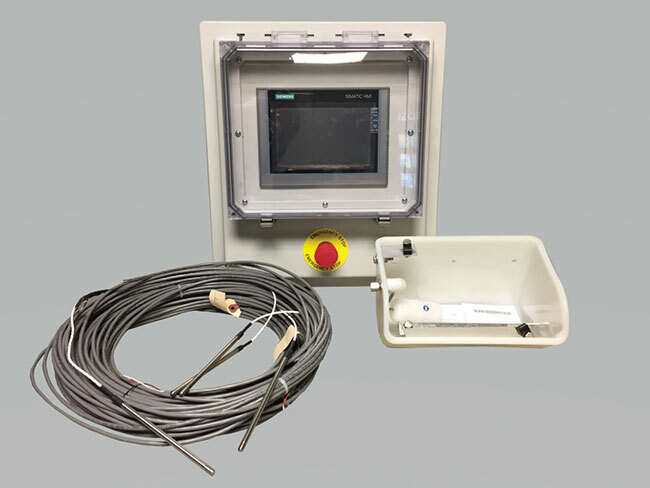 In the 1970s, with the introduction of the Model 778, Wagner Meters revolutionized the industry with the first generation of electrical field-based in-kiln moisture measurement systems. Ruggedly designed and easy-to-use, Wagner has continued to refine and update this basic and proven design concept with the launch of its current Model MC4000. 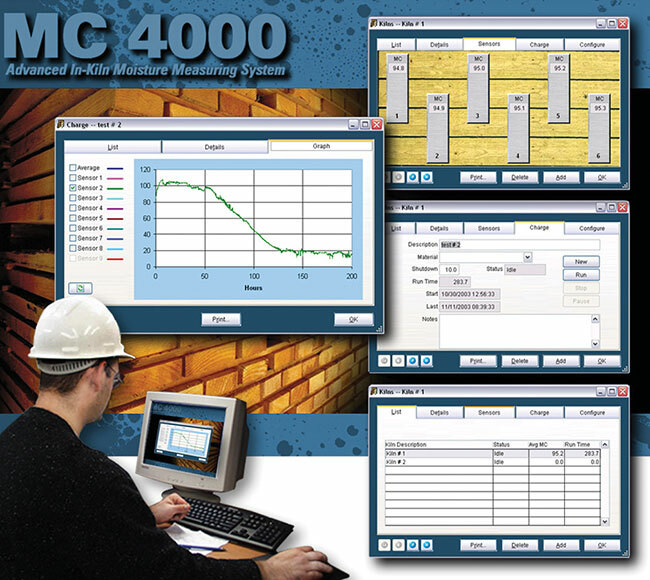 The Wagner Meters MC4000 can stand alone as a valuable, automatic in-kiln moisture measurement system, or can be interfaced with computerized kiln control system software packages, providing the kiln operator with an accurate moisture measurement and monitoring tool to afford more control over the kiln drying operation. At Nyle, the newest equipment is not a kiln, but technology to add to your kiln to make them some of the most efficient on the market today. With the NSC upgrade, you now have the very latest in kiln control technology, saving time and allowing access to the kilns from any device with a web browser. The web-based control can be used to make set point changes and monitor the current status of your kiln. A recipe style schedule control can be implemented to automatically make set point changes on an hourly basis throughout the drying cycle. This is all done through a secure web connection with individual user logins. Operators can control the drying cycle with schedules, which may be programmed into the control and be used for manual or automatic setpoint changes. Hildebrand has been serving the wood industry with drying kilns for over 50 years. Hildebrand manufactures a complete line of dry kilns – conventional kilns, continuous kilns, steamers, heat-treating, pre-dryers, vacuum dryers and kiln controls with online service. Hildebrand recently introduced the Hildebrand Continuous Kiln Alexander (HCK-A), designed for mills that produce dimension softwood. Its structure is made of aluminum, which is considered to be the material with the best combination of stability, longevity and cost-efficiency. 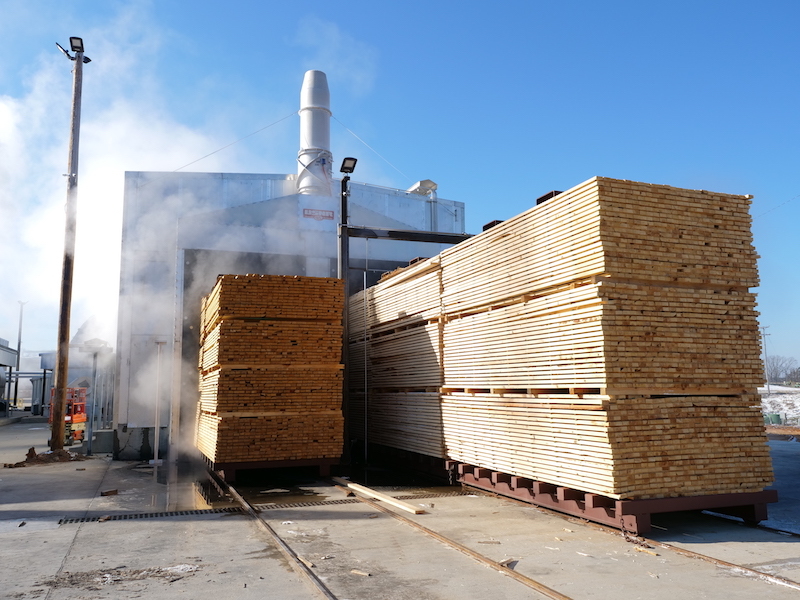 While designing the Hildebrand HCK-A, the emphasis was on creating the right drying conditions (temperature, climate, air speed) for the respective lumber moisture content. Lumber is placed length-wise on carts and rails and dried during transport through a number of zones with separate climates. Ultimately, lumber will be dried just as it would be in a conventional kiln. The technical features of each individual drying zone are customized to the drying state and moisture of the lumber packages passing through. Smithco’s 2000 mm to 84-inch, 12-blade propellers are primarily used in track-loaded lumber kilns drying softwoods. 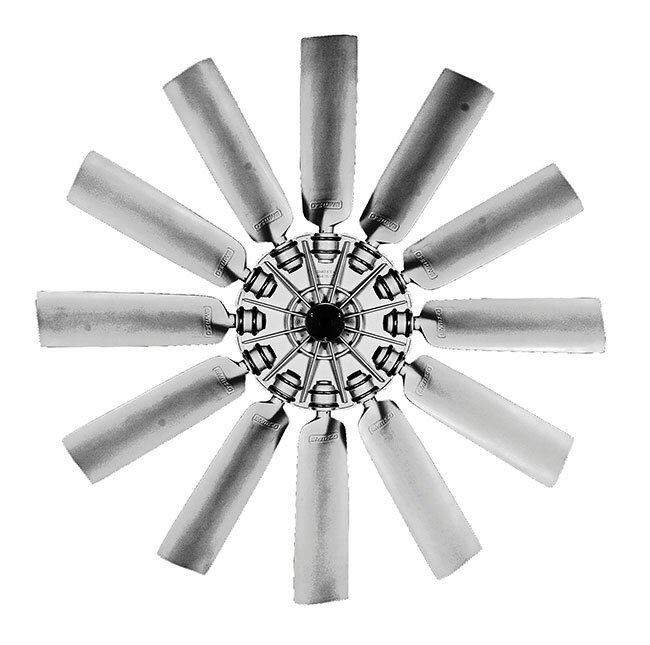 This propeller is designed for high-volume airflow at increased static pressures in the 2.0- to 2.5-inch (500 to 620 Pa) range with a maximum rotational speed of 840 RPM. These propellers have adjustable pitch blades and tested reversibility with full-flow in both directions. All Smithco propellers have keyed taper lock bushings and stainless steel hardware, and blade pitch is easily set using the Smithco Degree Gauge. EBI is the brand of high temperature totally enclosed dry kiln duty motors of unsurpassed quality and long-term reliability. From one hp up to 40 hp, 900 RPM, 1,200 RPM and 1,800 RPM, they are used by many hardwood and softwood lumber dry kiln manufacturers and sawmills in North America and Europe. EBI dry kiln duty motors are available through a North American distributor network for quick delivery. They are available in NEMA and IEC frames and covered by the best warranty on the market (up to three years). EBI motors are rated 248 F ambient temperature. They are CSA and UL approved, and ISO 9001 quality-controlled. 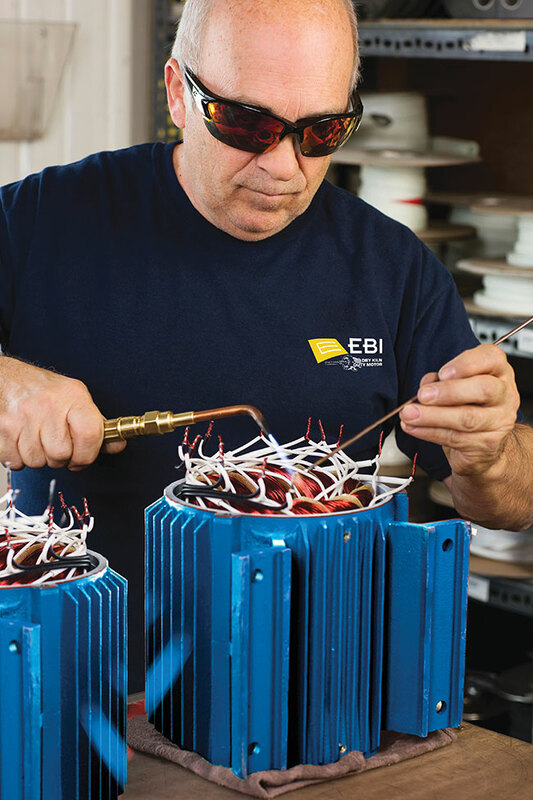 Today, more than 22,000 EBI motors have been used to dry lumber since 1995. Unitemp dry kilns are built to accommodate the demanding environment of today’s lumber suppliers. Unitemp kilns are energy efficient, capable of using multiple heat sources, adaptable to changing wood supply, and built to last. Custom inlets on fans, specialized multi-layer panel systems, fast installation, and short delivery times all lead to critical advantages for customers. The efficiency of custom downcomer design minimizes heat loss and combines with a unique heat distribution system to optimize heat distribution across the packs. From continuous kilns to heat treating units, Unitemp has supplied nearly every kind of kiln in it 70 plus year history. USNR’s modern kiln innovations represent the peak of control and adaptability for any drying application. USNR Counter Flow Kilns are the largest and most flexible in the industry with heating systems that produce a whopping 40 mm BTUs from a variety of fuel sources including steam, shavings, green fuel, and natural gas. The Green Fuel Burner gasifier can be manufactured as a hybrid burner using a combination of green sawdust and natural gas in the same system. Mills can switch between fuel sources to take advantage of price fluctuations and other market conditions. Fuel source flexibility keeps you drying through quarterly clean-outs, by using gas. 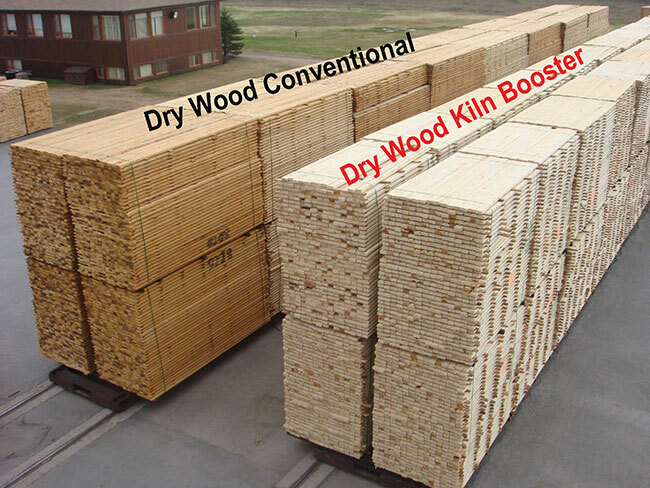 Kiln Boss expertly controls all wood drying variables to improve lumber quality. It tracks custom drying schedules, alerts you to system changes, and provides statistical reports. USNR has manufactured dry kilns for over 100 years and has the largest installed base in North America.